3. 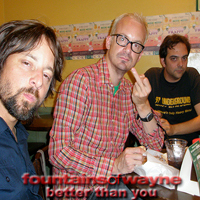 MP3's of Fountains of Wayne performance on Hey Joel! Then I just have a couple of general questions, if anyone could answer them for me. 1. Are the Loftypop Demos actually Fountains of Wayne, or a completely different band? 2. Why is there only a remastered version of Untouchable in the Pinwheel Demos, but not one that sounds like the unmastered Pinwheel Demos? Is there an unmastered version available anywhere? Thanks for any help with any of this. I'll step up to the plate and offer you some help. PM me an email address and I'll see what I can do . To answer your questions, the Loftypop Demos are NOT Fountains of Wayne. I don't know who they are but its not them. I don't know about any unmastered version of Untouchable sorry. OK, I've emailed you buddy, both addresses. I,ve got some live stuff i'll trade for your mp3's. What have you got, out of interest? My list. Mostly downloaded from the old download section. I would love tro here sence into you if anybody has it. I'm quite interested in this. I could send you You Gotta Go or Sense Into You, and then there's all the stuff on http://fow.mikedavidsmith.com/audio.php that is available for all. I'll get this boot uploaded to megaupload and send you the link if you can send me link for you gotta go and sence into you.